Back by popular demand for laser educational opportunities, the Collegiate™ is a complete femtosecond Ti:sapphire laser kit that bolts directly to a standard optical table. When it was introduced in 1994, the TS kit was the first commercial Ti:sapphire laser capable of generating pulses less than 12 femtoseconds in duration. 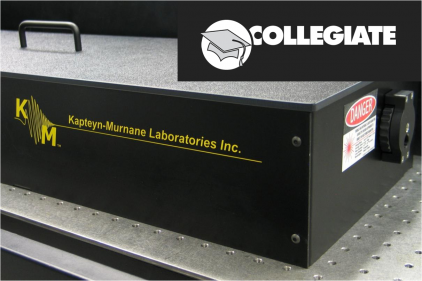 Although KMLabs now offers turn-key laser systems, the Collegiate is a low-cost, entry-level Ti:sapphire laser system with world famous performance. The Collegiate is especially well-suited for undergraduate laser laboratories, since the components of the Collegiate are easy to access and the optical layout is easy to understand. Students will learn about dispersion and ultrafast laser pulses as they adjust the dispersion compensation prisms inside the laser cavity. Once assembled, the Collegiate kits are capable of producing the same broad-bandwidth, ultrashort pulses as other KMLabs Ti:sapphire lasers. Multi-photon microscopy excels at imaging of living cells and relies on the intense light generated by ultrafast laser systems. In this work, The Authors use a TS laser kit from KMLabs to drive their multiphoton laser-scanning microscope and image the crimp length morphology of tendons. They find that the crimp length of the tendons is under cellular control and is a reflection of the mechanobiological environment of the extracellular matrix. With the advent of lasers and the soon following pulsed laser came the challenge of measuring the duration of these laser pulses. Modern electronics and photo-detectors are still not fast enough to measure the femtosecond duration pulses from ultra-fast laser systems. Various techniques emerged to accomplish this task, namely FROG and SPIDER. In this work, the Authors introduce a new technique – GRENOUILLE, based on FROG however with the capabilty of working in a single-shot modality. With a selection of some novel optics, the standard FROG spectrogram can be mapped to a CCD camera directly for each laser shot. GRENOUILLE is tested on a KM Labs Ti:Sapphire oscillator and compared to a calibrated multi-shot FROG device.